Airway epithelial cells are the major target for rhinovirus (RV) infection and express proinflammatory chemokines and antiviral cytokines that play a role in innate immunity. Previously, we demonstrated that RV interaction with TLR2 causes ILR-associated kinase-1 (IRAK-1) depletion in both airway epithelial cells and macrophages. 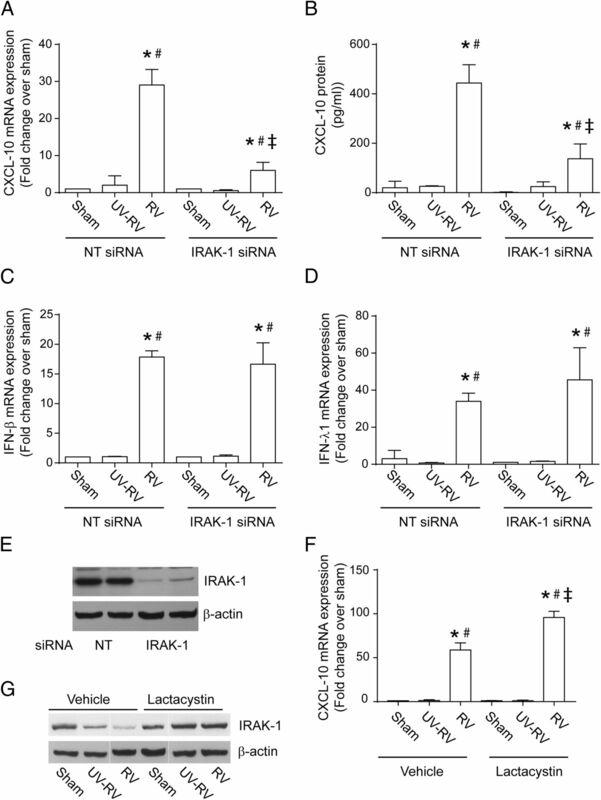 Further, IRAK-1 degradation caused by TLR2 activation was shown to inhibit ssRNA-induced IFN expression in dendritic cells. Therefore, in this study, we examined the role of TLR2 and IRAK-1 in RV-induced IFN-β, IFN-λ1, and CXCL-10, which require signaling by viral RNA. In airway epithelial cells, blocking TLR2 enhanced RV-induced expression of IFNs and CXCL-10. By contrast, IRAK-1 inhibition abrogated RV-induced expression of CXCL-10, but not IFNs in these cells. Neutralization of IL-33 or its receptor, ST2, which requires IRAK-1 for signaling, inhibited RV-stimulated CXCL-10 expression. In addition, RV induced expression of both ST2 and IL-33 in airway epithelial cells. In macrophages, however, RV-stimulated CXCL-10 expression was primarily dependent on TLR2/IL-1R. Interestingly, in a mouse model of RV infection, blocking ST2 not only attenuated RV-induced CXCL-10, but also lung inflammation. Finally, influenza- and respiratory syncytial virus–induced CXCL-10 was also found to be partially dependent on IL-33/ST2/IRAK-1 signaling in airway epithelial cells. Together, our results indicate that RV stimulates CXCL-10 expression via the IL-33/ST2 signaling axis, and that TLR2 signaling limits RV-induced CXCL-10 via IRAK-1 depletion at least in airway epithelial cells. To our knowledge, this is the first report to demonstrate the role of respiratory virus–induced IL-33 in the induction of CXCL-10 in airway epithelial cells. Airway epithelial cells, which are the primary target for respiratory viral infections, respond to viral exposure with a coordinated expression of cytokines and chemokines that is essential for elimination of virus. The expression of cytokines and chemokines in response to infection is tightly regulated by innate immune signaling via pattern recognition receptors to prevent excessive lung inflammation and tissue damage. Respiratory viruses are recognized by more than one PRR; therefore, the innate immune system must integrate the signaling through multiple PRRs and downstream signaling components to regulate appropriate cytokine signaling to eliminate the virus without causing tissue damage. Rhinovirus (RV) is responsible for the majority of common colds and disease exacerbations in patients with asthma, chronic obstructive pulmonary disease (COPD), and cystic fibrosis (1–3). Previously, we showed that RV stimulates expression of CXCL-1, CXCL-5, and CXCL-8 in airway epithelial cells via activation of TLR2 signaling, which is independent of viral replication (4, 5). In addition, we showed that activation of TLR2 signaling by RV also depletes ILR-associated kinase-1 (IRAK-1) by targeting IRAK-1 for proteasomal degradation (5). Later, depletion of IRAK-1 by TLR2 signaling was shown to limit ssRNA-induced IFN responses in dendritic cells by interfering with MyD88-dependent TLR7/9 signaling (6). RV-stimulated IFN and CXCL-10 responses are primarily dependent on dsRNA generated during viral replication (7–9). Based on these observations, we hypothesized that depletion of IRAK-1 by RV-induced activation of TLR2 signaling may limit viral replication–dependent induction of IFNs and CXCL-10 in airway epithelial cells, which is thought to contribute to antiviral defenses. Interestingly, our initial studies indicated the requirement of IRAK-1 for CXCL-10, but not for either type I or type III IFNs, and this report will therefore be focused on CXCL-10 expression. Recruitment of NK cells and T cells to the mucosal site to target and kill virus-infected cells is an important component of pulmonary antiviral defense. CXCL-10 (also known as IFN-γ–inducible protein of 10 kDa) is one of the ligands for CXCR3, a receptor that is expressed primarily on T and B lymphocytes, as well as NK cells, and therefore recruits these cells to mucosal sites. In addition, CXCL-10 has also been shown to enhance development of neutrophilic lung inflammation of viral and nonviral origin (10). Elevated levels of CXCL-10 have been observed during COPD, cystic fibrosis, and asthma exacerbations (11–13). CXCL-10 was also proposed to be a biomarker for viral exacerbations in asthma and cystic fibrosis (12, 13), indicating a pathogenic role of CXCL-10 in patients with chronic airway disease. Therefore, understanding the mechanisms underlying regulation of CXCL-10 expression may be necessary to limit the lung inflammation induced by CXCL-10. In airway epithelial cells, RV-stimulated CXCL-10 is regulated by several transcription factors including NF-κB (14), STAT-1 (15), and IFN regulatory factor (IRF)-1 (16). RV-stimulated CXCL-10 expression was demonstrated to be dependent on viral replication requiring dsRNA receptors, TLR3, melanoma differentiation-associated gene 5 (MDA5), and retinoic acid–inducible gene I (RIG-I) (7, 9). These observations indicate that recognition of dsRNA generated during RV infection by TLR3, MDA5, and RIG-I may activate NF-κB, IRF-1, and STAT-1 in a coordinated fashion to induce CXCL-10. However, none of these receptors has been demonstrated to signal via IRAK-1. Although airway epithelial cells are the richest source of CXCL-10 in the lungs (17), lung submucosal macrophages and peripheral blood monocyte-derived macrophages (PMDMs) were also shown to express CXCL-10 (18). In macrophages, RV was shown to stimulate CXCL-10 via activation of JAK-STAT1 signaling (18), which also does not require IRAK-1. Therefore, in this study, we explored the mechanisms by which IRAK-1 contributes to RV-induced CXCL-10 in airway epithelial cells and in PMDMs, which closely resemble submucosal macrophages in the lungs. We demonstrate for the first time, to our knowledge, that RV-induced CXCL-10 expression is regulated via IRAK-1–dependent paracrine/autocrine IL-33/ST2 signaling in airway epithelial cells and via TLR2/IL-1R in macrophages. Further, we show that ST2 signaling contributes to RV-induced CXCL-10 and lung inflammation in vivo. 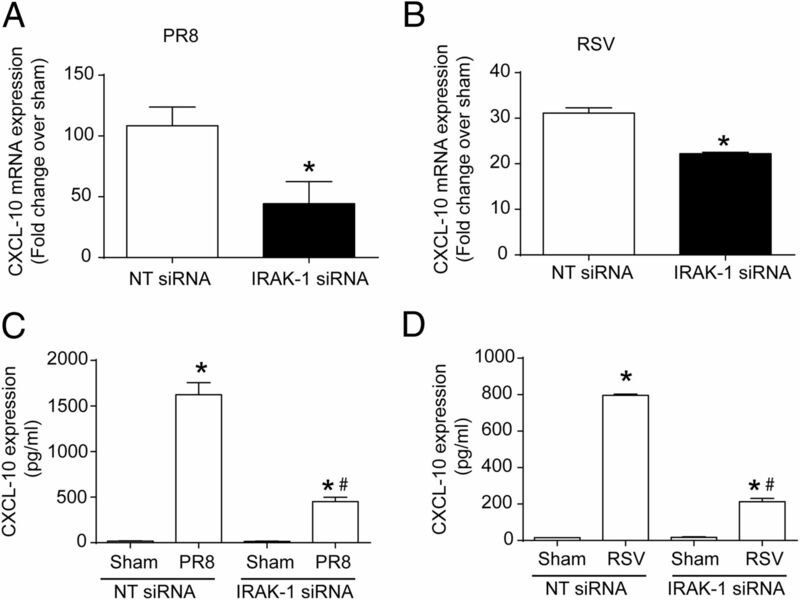 Finally, we demonstrate that, in airway epithelial cells, IRAK-1–dependent CXCL-10 expression is not unique to RV but is common to other ssRNA respiratory viruses such as influenza and respiratory syncytial virus (RSV). Bronchial epithelial cell line BEAS-2B cells (American Type Culture Collection, Manassas, VA) were grown in Bronchial Life media (Lifeline Cell Technology, Frederick, MD). Primary normal human airway epithelial cells were obtained from tracheobronchial segments of healthy nonsmokers collected at the time of double lung transplantation. Collection of tissue was approved by the Institutional Review Board at the University of Michigan. Primary airway epithelial cells were cultured at passage 1 at air–liquid interface as described previously (19). In brief, passage 1 primary airway epithelial cells were grown in transwells in Bronchial Life medium until the cells were confluent. The cultures were then shifted to air–liquid interface and maintained for 4 wk in a differentiation medium to promote mucociliary differentiation (20). Primary human peripheral blood monocytes (American Type Culture Collection) were cultured with 100 ng/ml M-CSF for 6 d to promote macrophage differentiation (PMDM) as previously described (21). Both RV16, a major group RV, and RV1B, a minor group RV, were purchased from American Type Culture Collection, propagated in H1 HeLa cells and partially purified by ultrafiltration using a 100-kDa cutoff membrane. Viral titer was determined by plaque assay using H1 HeLa cells (22). The <100-kDa fraction from purified RV preparation was used as sham control. RV was exposed to UV light as previously described to generate replication-deficient RV (23). H1N1 influenza virus, A/PR/34/8 (PR8), was passaged in Madin–Darby canine kidney (MDCK) cells. Virus was grown in MDCK cells in DMEM/F12 with ITS+ (BD Biosciences, Franklin Lakes, NJ) and trypsin, harvested at 72 h postinfection and titered by plaque assay in MDCK cells. RSV was kindly provided by Dr. N. Lukacs (University of Michigan). RSV subtype A, Umich/line 19 strain, was derived from a clinical isolate at the University of Michigan (also kindly provided by Dr. N. Lukacs) and was propagated in Hep2 cells. Infection was allowed to proceed until syncytia were observed. Cells were frozen at −80°C, and the supernatant was harvested, clarified, and titered by plaque assay. All of the in vitro experiments were performed with RV16. In vivo experiments were performed with RV1B because major group RVs do not infect mice efficiently (22). Moreover, RV1B has been shown to stimulate similar cytokine and chemokine responses in human airway epithelial cells in vitro (22). Eighty percent confluent monolayers of BEAS-2B cells or PMDMs were infected with RV or UV-RV at multiplicity of infection (MOI) of 1 or equal volume of sham (media from uninfected HeLa cells) and incubated for 90 min at 33°C. Infection media were replaced with fresh media and the incubation continued for another 22 h. Primary human airway epithelial cells differentiated into mucociliary phenotype were infected apically with 10 μl of PBS containing RV or UV-RV equivalent to 1 MOI and incubated for 16 h. In some studies, BEAS-2B cells were infected with influenza virus, PR8 at 0.1 MOI or RSV at 1 MOI, and incubated for 24 h at 37°C. At the MOI used for each virus, no significant cell death was observed over the time period studied as assessed by lactate dehydrogenase assay. In selected experiments, virus-infected cells were incubated in the presence of normal IgG, or neutralizing Abs to TLR2, ST2 or IL-33, (R&D Systems, Minneapolis, MN) or IL-1R antagonist (R&D Systems) or lactacystin (Sigma-Aldrich, St. Louis, MO). BEAS-2B cells were transfected with 10 pmol of nontargeting (NT) or ON-TARGETplus SMART pool siRNA specific to TLR2, TLR7, TLR8, IL-33, or IRAK-1 (Dharmacon, Chicago, IL) and incubated for 48 h. Knockdown of gene expression was confirmed by quantitative PCR (qPCR), flow cytometry, or Western blot analysis. Primary human airway epithelial cells were transduced with GIPZ lentiviral human IRAK-1 short hairpin RNA (shRNA) or control shRNA (both from Dharmacon) during the first week of culturing as described previously (19). Six- to 8-wk-old BALB/C mice were briefly anesthetized with isoflurane and infected with 50 μl of 1 × 108 PFU/ml RV1B by intranasal route (22, 24). Mice were treated with 100 μl of endotoxin-free PBS containing 5 μg/ml normal IgG or ST2 Ab by i.p. route on the day of infection and again at 24 h postinfection. Mice were sacrificed 48 h postinfection, and lungs were processed for either bronchoalveolar lavage or for isolation of total RNA. After relevant treatment, cells were washed with cold PBS and lysed in radioimmunoprecipitation assay buffer containing protease and phosphatase inhibitors. Equal amount of protein was subjected to Western blot analysis with Abs to IRAK-1 (Santa Cruz Biotechnology), p-IκB-α, total and p-STAT-1, IRF-1 (Cell Signaling), ST2 (R&D Systems), or β-actin (Sigma-Aldrich). Specific bands were quantified by densitometry using National Institutes of Health ImageJ and expressed as fold change over β-actin or over respective total protein. After relevant treatment, total RNA was isolated from airway epithelial cells or mouse lungs and the expression of CXCL-10, IFN-β, IFN-λ1, IL-33, and ST2 was determined by using gene-specific primers and presented as fold change over housekeeping gene, G3PDH (25). Protein levels of CXCL-10, IFN-λ1, IL-1β in cell culture medium was determined using ELISA kits purchased from R&D Systems. Chromatin immunoprecipitation (ChIP) assay was performed with a ChIP-It Kit (Active Motif, Carlsbad, CA) as described previously (26). In brief, after appropriate treatment, cells were fixed, lysed, and chromatin was subjected to enzymatic shearing. Chromatin fragments of 100–1000 bp were immunoprecipitated with an Ab to NF-κB Ab. ChIP and input DNA were purified and subjected to qPCR using primers specifically designed for IP-10 promoter region (positions −224 to −90), which spanned both the NF-κB and the IFN-stimulated response element binding sites: forward, 5′-TTTGGAAAGTGAAACCTAATTCA-3′; and reverse, 5′-AAAACCTGCTGGCTGTTCCTG-3′. To determine the specificity of the ChIP assay, we used primers designed for distal upstream region (−1716 to −1471): forward, 5′-GAAGGATCCCTCCATTGTCA-3′, and reverse, 5′-GTTGCTTGGGGTAAATGGAA-3′. The accessibility of the transcription site in the CXCL10 promoter region was assessed by using the EpiQ Chromatin analysis kit (Bio-Rad, Hercules, CA) as described previously (15). The primers used to amplify the region at CXCL-10 transcription site are: forward primer, 5′-GAAACAGTTCATGTTTTGGAAAGTGAAACC-3′; and reverse primer, 5′-GCTGAGACTGGAGGTTCCTCTGCTG-3′. In addition, samples were also subjected to qPCR with EpiQ kit reference and control primers. The data were analyzed using the EpiQ chromatin kit data analysis tool (www.bio-rad.com/epiq), which took into account the expression profiles of the reference and control genes in addition to CXCL-10. Statistical significance for normally distributed data were assessed by unpaired Student t test (for comparisons between two groups) or by ANOVA with Tukey–Kramer post hoc test (for comparisons between three or more groups). Nonparametric analysis, ANOVA on ranks with Kruskal–Wallis H test was used to determine the statistical significance if the data were not normally distributed. A p value ≤0.05 was considered statistically significant. Previously we have demonstrated that RV stimulates TLR2 activation (5). Because activation of TLR2 signaling has been shown to limit ssRNA-induced IFN responses (6), we examined whether RV-stimulated TLR2 activation limits subsequent expression of type I and type III IFNs and CXCL-10, each of which is viral replication dependent. BEAS-2B cells were transfected with TLR2 siRNA to genetically block TLR2 expression and were examined for RV-stimulated expression of INF-β (type I), IFN-λ1 (type III), and CXCL-10. Cells transfected with NT siRNA served as control for TLR2 siRNA-transfected cells. 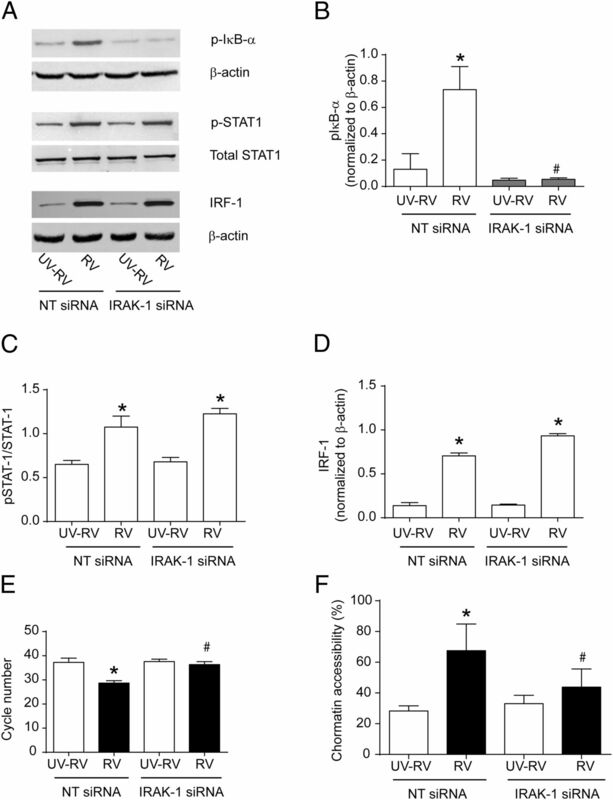 In NT siRNA-transfected cells, intact RV, but not replication-deficient UV-RV, induced mRNA expression for INF-β, IFN-λ1, and CXCL-10 (Fig. 1A–C). Interestingly, in TLR2 siRNA-transfected cells, RV-induced expression of both IFNs and CXCL-10 genes was significantly increased compared with similarly infected NT siRNA-transfected cells. TLR2 siRNA-transfected cells infected with RV also showed higher protein levels of CXCL-10 and IFN-λ1 in the medium compared with similarly infected NT siRNA-transfected cells (Fig. 1D, 1E). As observed previously, IFN-β protein could not be detected despite 20- to 40-fold increase in IFN-β mRNA (23). RV-stimulated CXCL-8 (IL-8) and CXCL-1 (GRO-α), each of which is independent of viral replication, was significantly attenuated in TLR2-transfected cells compared with NT siRNA-transfected cells (Fig. 1F, 1G) as previously demonstrated (5). Efficient knockdown of TLR2 expression by TLR2 siRNA was confirmed by both qPCR and flow cytometry (Supplemental Fig. 1). Together these results suggest that TLR2 activation limits viral replication-dependent expression of type I and type II IFNs and CXCL-10. TLR2 alters RV-induced cytokine expression. BEAS-2B cells were transfected with either NT or TLR2 siRNA. Cells were then infected with sham, UV-RV, or RV and incubated for 16 h. Total RNA was isolated and subjected to qPCR, and results were normalized to housekeeping gene, G3PDH, and expressed as fold increase over sham controls (A–C). Media were used to determine the protein levels of cytokines by ELISA (D–G). Data represent mean ± SEM calculated from at least three independent experiments done in duplicate. *p ≤ 0.05 ANOVA, different from sham. #p ≤ 0.05 ANOVA, different from UV-RV–infected cells. ‡p ≤ 0.05 ANOVA, different from NT siRNA-transfected cells. Previously, we and others have demonstrated that TLR2 signaling activated by RV or TLR2 ligands causes IRAK-1 depletion in BEAS-2B cells and other innate immune cells (5, 6). Further, activation of TLR2 signaling–induced IRAK-1 depletion inhibits IFN expression in response to ssRNA (6). Therefore, we investigated whether TLR2 limits RV-induced IFN-β, IFN-λ1, and CXCL-10 via IRAK-1 depletion. BEAS-2B cells transfected with NT or IRAK-1 siRNA were infected with sham, UV-RV, or RV and examined for the expression of IFN-β, IFN-λ1, and CXCL-10. RV-stimulated expression of CXCL-10 was significantly decreased in IRAK-1 siRNA-transfected cells compared with NT siRNA-transfected cells (Fig. 2A, 2B). However, IRAK-1 knockdown had no effect on expression of either IFN-β or IFN-λ1 (Fig. 2C, 2D) in response to RV infection. Efficiency of IRAK-1 knockdown by gene-specific siRNA was confirmed by Western blot analysis (Fig. 2E). Genetic inhibition of IRAK-1 inhibits RV-stimulated expression of CXCL-10, but not IFNs. BEAS-2B cells were transfected with either NT or IRAK siRNA and then infected with sham, UV-RV, and RV and incubated for 16 h. Total RNA was isolated and subjected to qPCR. Results were normalized to housekeeping gene, G3PDH, and expressed as fold increase over sham controls (A, C, and D). Media were used to determine CXCL-10 protein levels by ELISA (B). From identical experiments total cell lysates were subjected to Western blot analysis with IRAK-1 Ab to confirm the knockdown of IRAK-1 by gene-specific siRNA (E). BEAS-2B cells were infected with sham, UV-RV, or RV and incubated in the presence or absence of 5 μM of lactacystin for 16 h. CXCL-10 mRNA expression was assessed by qPCR and expressed as fold increase over sham control (F), and IRAK-1 expression was determined by Western blot analysis (G). Line in image (G) represents lanes from different parts of the same gel. (A–D and F) Data represent mean ± SEM calculated from at least three independent experiments done in duplicates. *p ≤ 0.05 ANOVA, different from respective sham-infected cells. #p ≤ 0.05 ANOVA, different from UV-RV–infected cells. ‡p ≤ 0.05 ANOVA different from NT siRNA-transfected or media-treated control cells. (E and G) Images are representative of 3–10 independent experiments. Demarcation lines in (G) indicate lanes are from different parts of the same blot. Previously, we demonstrated that RV-induced reduction in IRAK-1 can be prevented by the proteasomal inhibitor, lactacystin (5). To examine whether lactacystin restores RV-induced CXCL-10, we incubated sham, UV-RV, or RV-infected cells in the presence of 5 μM of lactacystin or media alone (control), and CXCL10 levels were assessed. Lactacystin-treated cells infected with RV showed a significant increase in CXCL-10 compared with RV-infected control cells, and this was associated with restoration of IRAK-1 expression (Fig. 2F, 2G). 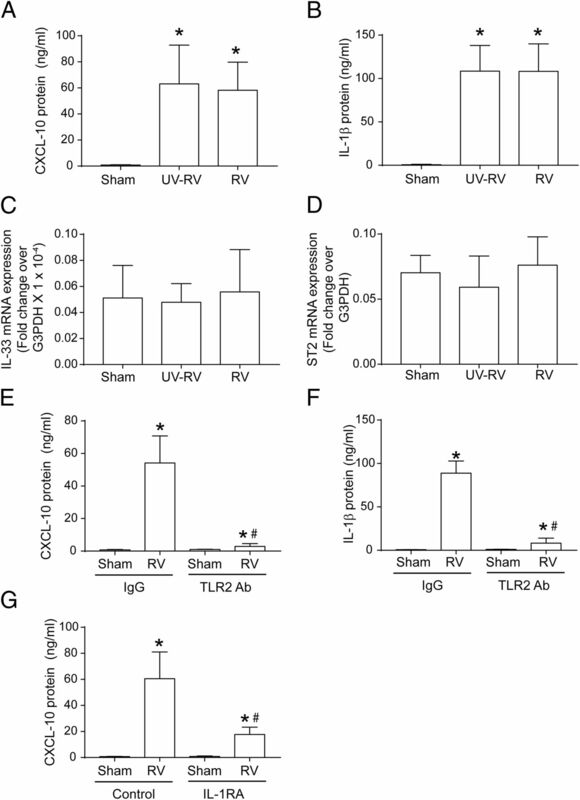 Collectively, these results indicate that IRAK-1 is required for enhancing CXCL-10 expression induced by RV and that TLR2 may limit RV-induced CXCL-10 via IRAK-1 depletion. Because expression of CXCL-10 was dependent on RV replication, we used replication-deficient UV-RV in subsequent experiments as a negative control. RV-induced CXCL-10 expression has been shown to be dependent on activation of transcription factors NF-κB, STAT-1, and IRF1 (14). Therefore, we determined the effects of IRAK-1 knockdown on RV-induced phosphorylation of STAT1 and IκB-α, and the expression of IRF-1. Compared with NT siRNA-transfected cells, IRAK-1 siRNA-transfected cells showed reduction only in RV-induced IκB-α phosphorylation, but not in STAT1 phosphorylation or expression of IRF1 (Fig. 3A). Quantitation by densitometry indicated significant decreases in IκB-α phosphorylation in RV-infected IRAK-1 siRNA-transfected cells compared with similarly infected NT siRNA-transfected cells (Fig. 3B). There was no significant difference in RV-induced p-STAT1 or IRF-1 between NT siRNA and IRAK-1 siRNA-transfected cells (Fig. 3C, 3D). Because IκB-α regulates NF-κB activation (27), we assessed the binding of NF-κB to CXCL-10 promoter region by ChIP assay. Compared with UV-RV, RV-infected NT siRNA-transfected cells showed significantly increased binding of NF-κB to CXCL-10 promoter (the lower the cycle number, the higher the binding of NF-κB to CXCL-10 promoter) (Fig. 3E). This was substantially reduced in RV-infected IRAK-1 siRNA-transfected cells. Because the P65 subunit of NF-κB engages the CBP/P300 complex, which has histone acetyl transferase activity (28), binding of NF-κB to CXCL-10 promoter may enhance DNA accessibility around the transcription initiation site. To examine this notion, we used the EpiQ chromatin analysis kit and specific primers that target the TATA box in the CXCL-10 promoter to assess the DNA accessibility at the transcription initiation site. RV-infected NT siRNA-transfected cells showed significantly increased DNA accessibility around the TATA box region in the CXCL-10 promoter compared with UV-RV–infected cells (Fig. 3F). In contrast, IRAK-1 siRNA-transfected cells infected with RV did not show a substantial increase over respective UV-RV controls in the DNA accessibility around the TATA box region, implying that IRAK-1 may regulate RV-induced CXCL-10 by modulating chromatin accessibility in the transcription start site of the CXCL-10 promoter. IRAK-1 is required for RV-stimulated phosphorylation of IκB-α and to enhance binding of NF-κB to CXCL-10 promoter. BEAS-2B cells were transfected with either NT or IRAK siRNA and then infected with UV-RV or RV and incubated for 4 h. Cell lysates were subjected to Western blot analysis (A). Images are representative of three independent experiments. p-IκB-α, p-STAT-1, and IRF-1 were quantified by densitometry and normalized to β-actin, total STAT-1, and β-actin, respectively (B–D). From identical experiments, ChIP assay was performed to examine the binding of NF-κB to the promoter region of CXCL-10 (E). From another set of experiments, total DNA was isolated and used for determination of chromatin accessibility in the promoter region of CXCL-10 (F). Data represent mean and SEM calculated from three independent experiments. (B–F) Data represent mean ± SEM calculated from at least three independent experiments done in duplicates. *p ≤ 0.05 ANOVA, different from respective UV-RV–infected cells. #p ≤ 0.05 ANOVA, different from NT siRNA-transected or media-treated control cells. IL-1R family, but not TLR7/8 receptor signaling, contributes to RV-induced CXCL-10. RV-stimulated CXCL-10 expression depends on activation of dsRNA receptors MDA5, TLR3, and RIG-I (7–9), but these receptors do not signal via IRAK-1. Therefore, we examined the potential role of TLR7/8, which recognize ssRNA and require IRAK-1 for signaling in RV-induced CXCL-10 expression. BEAS-2B cells were transfected with NT, TLR7, or TLR8 siRNA, infected with RV, as described earlier, and CXCL-10 expression was assessed. TLR7 or TLR8 siRNA-transfected cells showed CXCL-10 expression similar to NT siRNA-transfected cells in response to RV infection (Supplemental Fig. 2A), indicating that neither TLR7 nor TLR8 participates in RV-stimulated CXCL-10 expression. Knockdown of TLR7 and TLR8 was confirmed by qPCR (Supplemental Fig. 2B). RV stimulates expression of both IL-1β and IL-33 (29, 30), and this can respectively activate IL-1Rs and IL-33Rs (ST2). Because both IL-1Rs and IL-33Rs require IRAK-1 for signaling, we examined the contribution of these receptors in RV-induced CXCL-10 expression. BEAS-2B cells were infected with RV and incubated in the presence of IL-1R antagonist (to block IL-1R) or neutralizing Ab to ST2 (to block IL-33R), and protein levels of CXCL-10 were measured in the medium after 16 h. IL-1R antagonist inhibited RV-induced CXCL-10 by only 30% at the highest concentration used (Fig. 4A). 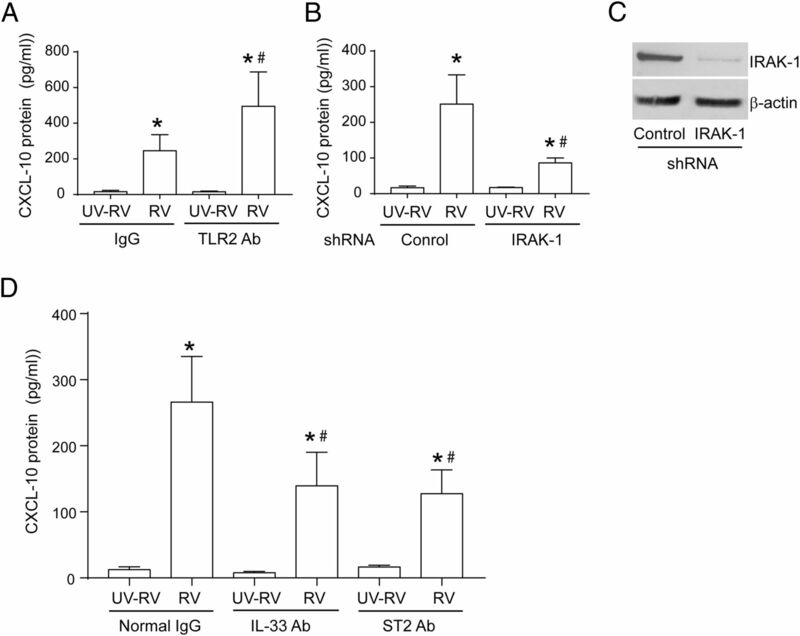 Inhibition of IL-1β by gene-specific siRNA also partially inhibited RV-induced CXCL-10 (22.8 ± 3.57). In contrast, neutralizing Ab to ST2 receptor caused dose-dependent inhibition of RV-induced CXCL-10 expression causing a >90% at the highest concentration used (Fig. 4B). Further inhibition of IL-33 with neutralizing Ab to IL-33 also abrogated RV-induced CXCL-10 expression (Fig. 4C). Isotype control IgG did not alter RV-induced CXCL-10 expression. Contribution of IL-33 to RV-induced CXC-10 was further confirmed by genetically inhibiting IL-33 using IL-33 siRNA. Compared with NT-siRNA, IL-33 siRNA-transfected cells infected with RV showed significant reduction in CXCL-10 expression (Supplemental Fig. 3A). Knockdown of IL-33 by gene-specific siRNA was confirmed by qPCR (Supplemental Fig. 3B). Finally, RV infection also increased mRNA expression of IL-33 (Fig. 4D). However, we were not able to detect IL-33 protein by ELISA. These results indicate that, although both IL-1R and ST2 contribute to RV-stimulated CXCL-10 expression, ST2 plays a major role in this process. IL-1 and IL-33R contribute to RV-induced CXCL-10. BEAS-2B cells were infected with UV-RV or RV and incubated in the presence of IL-1R antagonist (IL-1RA) (A), neutralizing Ab to ST2 (B) or IL-33 (C). CXCL-10 protein was estimated in the cell culture media by ELISA (A–C). BEAS-2B cells were infected with sham, UV-RV, or RV, and expression of IL-33 was determined by qPCR (D). Data represent mean ± SEM calculated from three to four independent experiments done in triplicate. *p ≤ 0.05 ANOVA, different from respective UV-RV–infected cells. #p ≤ 0.05 ANOVA, different from media- (A), normal IgG– (B and C), or sham- (D) treated controls. IL-33 synergistically enhances RV-induced expression of CXCL-10. Next, we examined whether IL-33 by itself can stimulate CXCL-10 in airway epithelial cells. Surprisingly, even at the highest concentration (1 ng/ml), IL-33 did not stimulate CXCL-10 expression in BEAS-2B cells (Fig. 5A). However, addition of IL-33 further increased RV-induced CXCL-10 (Fig. 5B). These results indicate that ST2 receptor may become available for IL-33, only after RV infection. To examine this notion, we determined the expression of ST2 in UV-RV– and RV-infected cells by Western blot analysis. We found a significant induction of ST2 expression after RV infection (Fig. 5C, 5D). 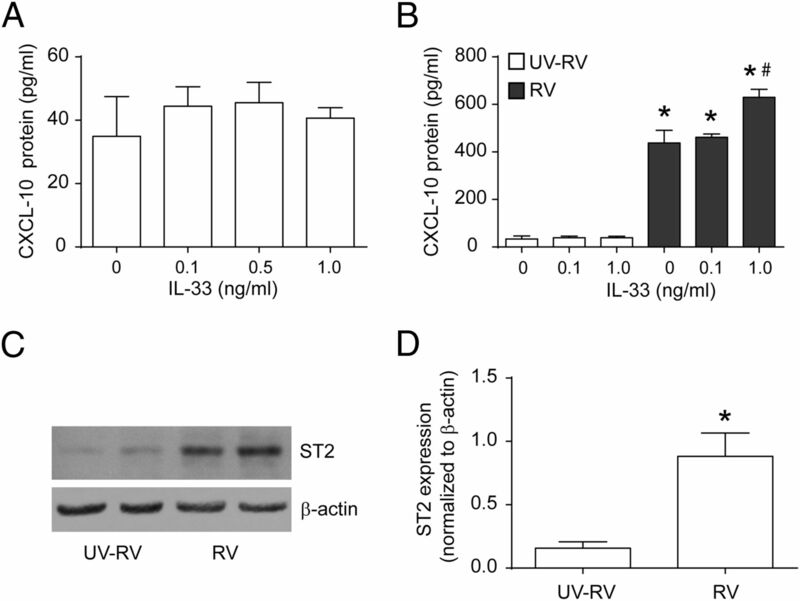 Together these results imply that RV stimulates both IL-33 and ST2 expression and promotes interaction of IL-33 with its receptor leading to IRAK-1–dependent CXCL-10 expression. We then confirmed these results in primary normal human airway epithelial cells differentiated into mucociliary phenotype, which closely mimic airway epithelium in vivo. 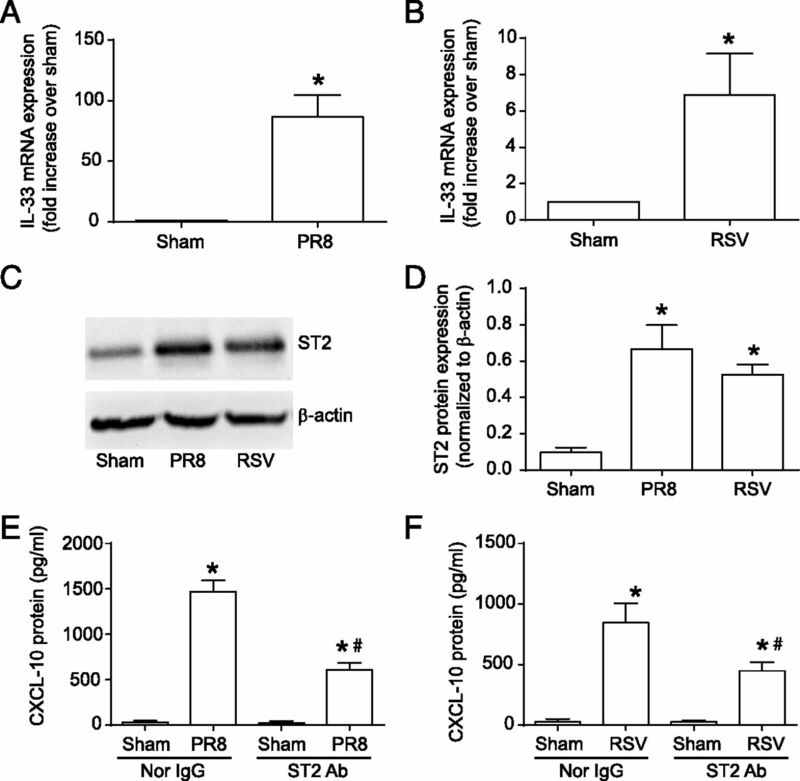 rIL-33 enhances RV-stimulated expression of CXCL-10 and induces ST2 receptor expression. BEAS-2B cells were treated with rIL-33 (A) or infected with UV-RV or RV and incubated in the presence of rIL-33 for 16 h. CXCL-10 protein in media was estimated by ELISA. BEAS-2B cells were infected with UV-RV or RV and incubated for 16 h. The expression of ST2 was determined by Western blot analysis (C). Band intensities were quantified by ImageJ and expressed as fold control over β-actin (D). (A, B, and D) Data represent mean and SEM calculated from three to four independent experiments performed in triplicate. *p ≤ 0.05 ANOVA (B) or t test (D), different from UV-RV. #p ≤ 0.05 ANOVA, different from RV alone-infected cells. (C) Image is representative of four independent experiments. IRAK-1/IL-33/ST2 participates in RV-stimulated CXCL-10 in primary human airway epithelial cells. In the initial experiment, we assessed the role of TLR2 in limiting RV-induced CXCL-10. Mucociliary-differentiated primary human airway epithelial cells were preincubated with 0.5 μg/ml neutralizing Ab to TLR2 or normal IgG for 1 h, infected with UV-RV or RV and incubated for another 16 h in the presence of anti-TLR2 Ab or normal IgG, and examined for CXCL-10 protein expression by ELISA. RV-infected primary airway epithelial cell cultures produced (Fig. 6A) more CXCL-10 than UV-RV–infected cells. In the presence of neutralizing Ab, RV-stimulated CXCL-10 production went up further, indicating that TLR2 limits RV-induced CXCL-10 in primary airway epithelial cells similar to that observed in bronchial epithelial cell line BEAS-2B. RV stimulates CXCL-10 expression in primary airway epithelial cells, which is partially dependent on IL-33 and ST2. Mucociliary-differentiated primary airway epithelial cells were preincubated with normal IgG or TLR2 Ab (0.5 μg/ml), infected apically with UV-RV or RV, and incubated in the presence of 0.5 μg/ml normal IgG or TLR2 Ab for 16 h, and CXCL-10 was measured in the basolateral medium by ELISA (A). Control or IRAK-1 shRNA-transduced primary airway epithelial cells were infected with UV-RV or RV, and CXCL-10 in the medium was measured after 16 h (B). Knockdown of IRAK-1 was confirmed by Western blot analysis (C). Primary airway epithelial cell cultures infected with UV-RV or RV were incubated in the presence of 1 μg/ml normal IgG or Abs to IL-33 or ST2, and CXCL-10 in the medium was assessed after 16 h (D). (A, B, and D) Data represent mean ± SEM calculated from three to four independent experiments done in duplicate or triplicate. *p ≤ 0.05 ANOVA, different from UV-RV–infected cells. #p ≤ 0.05 ANOVA, different from RV-infected IgG-treated cells. (C) Image is representative of four independent experiments. Next, we determined the contribution of IRAK-1, IL-33, and ST2 receptor in RV-induced CXCL-10 expression. To determine the requirement for IRAK-1 in RV-induced CXCL-10 expression, we infected primary airway epithelial cells transduced with IRAK-1 or control shRNA with UV-RV or RV and then determined CXCL-10 expression by ELISA. Cells transduced with IRAK-1 shRNA and then infected with RV showed significant reduction in CXCL-10 compared with similarly infected control shRNA transduced cells (Fig. 6B). Knockdown of IRAK-1 by gene-specific shRNA was confirmed by Western blot analysis (Fig. 6C). To assess the contribution of ST2 receptor and IL-33, we infected primary airway epithelial cell cultures with RV or UV-RV and incubated them in the presence of normal IgG or Ab to IL-33 or ST2, and CXCL-10 expression was determined after 16 h. As observed with BEAS-2B cells, Ab to both IL-33 and ST2 inhibited RV-induced CXCL-10 expression in the primary mucociliary-differentiated airway epithelial cell cultures (Fig. 6D). Together these results indicate the participation of IRAK-1/IL-33/ST2 in RV-induced CXCL-10 in primary bronchial epithelial cells. TLR2 and IL-1R, but not ST2, are required for RV-induced CXCL-10 expression in PMDMs. Previously, human PMDMs were shown to express CXCL-10 in response to RV similar to bronchoalveolar lavage monocytic macrophages (18). We demonstrated in our earlier studies that RV depletes IRAK-1 in macrophages via TLR2 (5). Therefore, we examined whether RV-induced CXCL-10 requires IL-33/ST2 signaling axis in macrophages similar to that observed in airway epithelial cells. Human PMDMs (5) infected with RV showed expression of CXCL-10 and IL-1β, but not IL-33 or ST2 (Fig. 7A–D). Most importantly, expression of CXCL-10 was found to be independent of viral replication in these cells as observed previously (18). Because there was no difference between UV-RV and RV, we used only sham and RV in the following experiments involving neutralization Abs. RV-stimulated CXCL-10 is independent of IL-33/ST2 in macrophages: PMDMs were infected with sham, UV-RV, or RV and incubated for 16 h. Protein expression of CXCL-10 and IL-1β in the spent medium was assessed by ELISA (A and B). Expression of IL-33 and ST2 was assessed by qPCR (C and D). PMDMs were preincubated for 1 h with 0.5 μg/ml normal IgG or Ab to TLR2 (E and F), or with 100 ng/ml IL-1R antagonist (IL-1RA) (G), infected with sham or RV, and incubation continued for another 16 h, and the expression of IL-1β or CXCL-10 was determined by ELISA. Data represent mean ± SEM calculated from three independent experiments done in duplicate or triplicate. *p ≤ 0.05 ANOVA, different from UV-RV–infected cells. #p ≤ 0.05 ANOVA, different from RV-infected cells treated with normal IgG or media alone. To assess the role of TLR2 in RV-induced CXCL-10 and IL-1β, we preincubated PMDMs with 0.5 μg/ml TLR2 neutralization Ab or IgG (control), infected them with sham or RV, and assessed for CXCL-10 and IL-1β expression. RV-infected PMDMs treated with TLR2 Ab showed significantly lower expression of CXCL-10 and IL-1β than similarly infected cells treated with normal IgG (Fig. 7E, 7F). In addition, treatment with IL-R antagonist also inhibited RV-induced expression of CXCL-10 in these cells (Fig. 7G). In contrast, ST2 neutralization Ab had no effect on expression of either CXCL-10 or IL-1β (data not shown). These results indicate that RV-induced CXCL-10 is primarily driven by IRAK-1–dependent TLR2 and IL-1R in PMDMs and not by ST2 receptor. Neutralization of ST2 inhibits RV-induced CXCL-10 in vivo. Previously, we have shown that RV induces viral replication–dependent gene expression including CXCL-10 in mouse lung infection model (22, 31) indicating the suitability of this model to determine the role of ST2 in RV-induced CXCL-10 expression. Mice were infected with RV by intranasal route and then treated with 5 μg/ml ST2 Ab or normal IgG i.p. on days 0 and 1. Mice were sacrificed 48 h post-RV infection, and expression of CXCL-10 and total and differential cell counts in bronchoalveolar lavage were determined. Compared with RV-infected mice treated with normal IgG, RV-infected mice treated with ST2 Ab showed significant reduction in total cell counts, neutrophils, and lymphocytes (Fig. 8A, 8C, 8D). 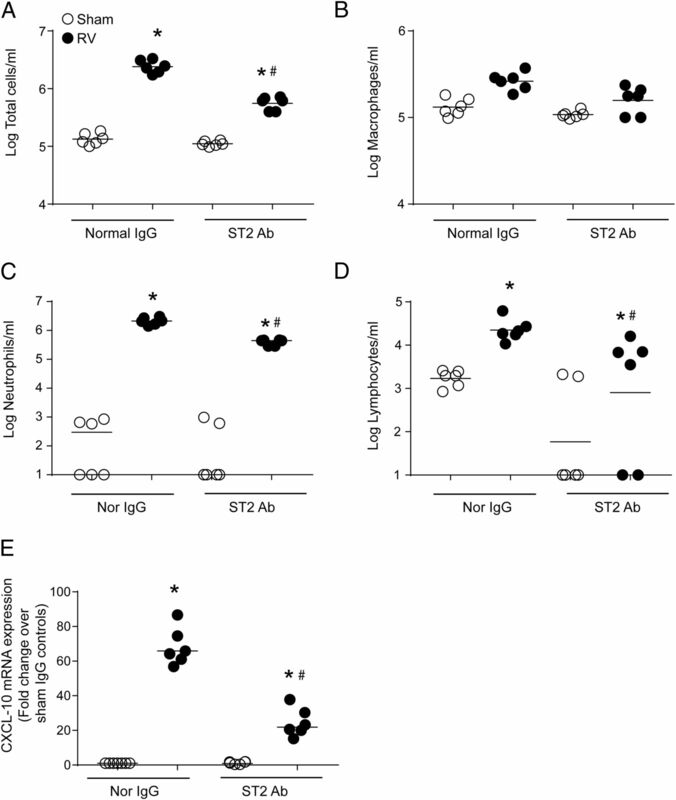 Although the number of macrophages tended to decrease, the difference between normal IgG and ST2 Ab groups was not statistically significant (Fig. 8B). The RV-infected ST2 Ab–treated mice also showed attenuated expression of CXCL-10 (Fig. 8E). 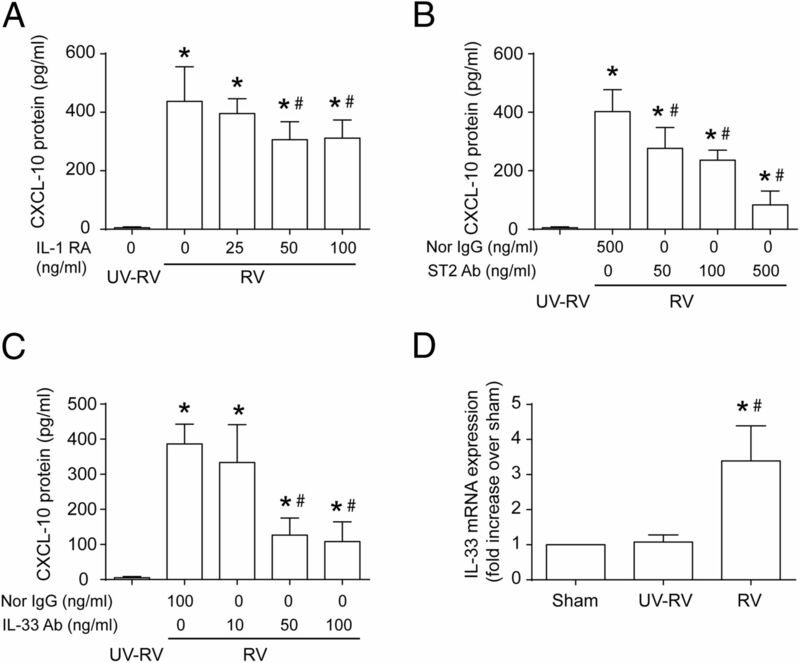 These results indicate that inhibition of ST2 receptor not only inhibits expression of CXCL-10, but also reduces lung inflammation in RV-infected animals. BALB/C (6–8 wk old) mice were infected with sham or RV by intranasal route, and 100 μl of endotoxin-free PBS containing 5 μg/ml normal IgG or ST2 Ab was injected by i.p. route on the day of infection and again after 24 h postinfection. Mice were sacrificed 48 h postinfection, BAL was performed to assess the total and differential cell counts (A–D), and lungs were processed for determination of CXCL-10 by qPCR (E). Data represent geometric mean with range from two independent experiments with three replicates. *p ≤ 0.05 ANOVA on ranks, different from UV-RV–infected cells. #p ≤ 0.05 ANOVA on ranks, different from RV-infected cells treated with normal IgG or media alone. IRAK-1 contributes to RSV and influenza virus-stimulated CXCL-10. We next sought to determine whether other respiratory viruses also stimulate CXCL-10 via the IL-33/ST2/IRAK-1 signaling axis in bronchial epithelial cells. BEAS-2B cells were transfected with IRAK-1 or NT-siRNA and then infected with RSV or influenza virus (PR8) and IP-10 mRNA, and protein levels were determined after 24 h. Compared with NT-siRNA transfected cells, IRAK-1 siRNA transfected cells showed significantly lower CXCL-10 expression at both mRNA (Fig. 9A, 9B) and protein levels (Fig. 9C, 9D) in response to either influenza or RSV infection, indicating the requirement of IRAK-1 in this process. To determine the contribution of virus-induced IL-33, we examined the expression of IL-33 mRNA and ST2 protein in response to influenza and RSV infection, and also examined the release of CXCL-10 protein in the presence of neutralizing Ab to ST2 from the cells infected with influenza or RSV. Both influenza virus and RSV enhanced expression of IL-33 mRNA (Fig. 10A, 10B) and ST2 protein (Fig. 10C, 10D) in BEAS-2B cells. In addition, neutralization of ST2 inhibited both influenza virus and RSV-induced CXCL-10 (Fig. 10E, 10F). Together, these results imply that respiratory RNA viruses stimulate CXCL-10 expression via IL-33/IRAK-1 signaling axis. IRAK-1 also contributes to RSV- and influenza virus–induced CXCL-10. BEAS-2B cells were transfected with either NT or IRAK siRNA and then infected with sham, RSV at MOI of 1, or influenza virus at MOI of 0.1 and incubated for 16 h. Expression of CXCL-10 mRNA (A and B) and CXCL-10 protein in the media (C and D) were determined by qPCR and ELISA, respectively. Data represent mean ± SEM calculated from at least three independent experiments done in duplicate. *p ≤ 0.05 t test, different from sham. #p ≤ 0.05 ANOVA, different from respective NT siRNA-transfected cells. Neutralization of ST2 inhibits RSV and influenza virus–stimulated CXCL-10. BEAS-2B cells were infected with sham, influenza virus (PR8), or RSV, and the expression of IL-33 mRNA was determined by qPCR (A and B) and protein was determined by Western blot analysis (C and D). BEAS-2B cells were infected with sham, influenza virus, or RSV and incubated in the presence of 500 μg/ml normal IgG or Ab to ST2. CXCL-10 protein in the media was quantified by ELISA (E and F). (A, B, and D–F) Data are mean and SEM calculated from three independent experiments. *p ≤ 0.05 t test. #p ≤ 0.05 ANOVA, different from normal IgG–treated controls. (C) Image is representative of four independent experiments. Although CXCL-10 produced by airway epithelial cells plays an important role in recruiting NK cells and cytotoxic CD8+ T cells to target and to kill virus-infected cells in the lungs (32), excess CXCL-10 production may contribute to lung inflammation (10, 33). Therefore, it is essential to limit the expression of CXCL-10 in response to virus infection. In this study, we identify one of the novel mechanisms by which airway epithelial cells, a major source of CXCL-10 in the lungs (17), may limit the production of CXCL-10 post virus infection. We demonstrate for the first time, to our knowledge, that RV requires IRAK-1 for maximal induction of CXCL-10 in airway epithelial cells and in macrophages. Further, we found that, in airway epithelial cells, but not in macrophages, IL33/ST2/IRAK-1 is required for maximal induction of CXCL-10 by RV and that TLR2 limits CXCL-10 via depletion of IRAK-1. In addition, we show that inhibition of ST2 limits RV-induced CXCL-10, as well as lung inflammation in mice. Finally, other respiratory viruses, such as influenza and RSV, were also found to induce CXCL-10 via IL-33/ST2/IRAK-1 signaling, indicating one of the common mechanisms by which respiratory viruses induce CXCL-10 in airway epithelial cells. Previously, we demonstrated that RV depletes IRAK-1 protein in bronchial epithelial cells via activation of TLR2 without affecting IRAK-1 transcription (5). Genetic inhibition of IRAK-1 abrogated RV-induced CXCL-8 in bronchial epithelial cells, indicating that degradation of IRAK-1 may be essential to limit excessive CXCL-8 production post viral infection. Following our studies, Liu et al. (6) showed that IRAK-1 is essential for ssRNA-induced type I IFN in dendritic cells and that depletion of IRAK-1 after TLR2 activation abrogates ssRNA-stimulated antiviral type I IFNs. Because RV is an ssRNA virus and the viral genome is released from the capsid protein into the host cells during replication, we postulated that IRAK-1 depletion may affect replication-dependent cytokine responses, such as IFN-β, IFN-λ1, and CXCL-10, in airway epithelial cells. As hypothesized, genetic inhibition of TLR2 prevented degradation of IRAK-1 and enhanced expression of all three cytokines. To our surprise, however, genetic knockdown of IRAK-1 abrogated only CXCL-10 expression without affecting the expression of both IFN genes. Moreover, knockdown of either TLR7 or TLR8 had no effect on expression of IFNs or CXCL-10, indicating that RV ssRNA may not be sufficient to induce replication-dependent cytokine responses in airway epithelial cells. It is also possible that TLR7 and TLR8 may not play a significant role in airway epithelial cells because these receptors are expressed at very low levels in airway epithelial cells (5). Our ongoing studies indicate TLR2-dependent increase in the expression of suppressor of cytokine signaling (SOCS)-1 in RV-infected cells. Because SOCS-1 inhibits RV-induced type I and type III IFN expression in airway epithelial cells (34), we speculate that TLR2 may limit RV-stimulated IFNs via SOCS-1, and this will be investigated in the future. RV-induced CXCL-10 expression in airway epithelial cells has been shown to be dependent on dsRNA receptors including MDA5, RIG-I, and TLR3 (7, 9), and none of these receptors requires IRAK-1 for signaling indicating involvement of IL-1R or IL-1R–like receptors that require IRAK-1. Previously, a role for IL-1R has been demonstrated in RV-induced IL-8 and IL-6 in airway epithelial cells (8, 35). Furthermore, IL-1β was shown to synergistically increase RV-induced IL-8 in airway epithelial cells (29). In addition, IL-1β by itself induces CXCL-10 expression (36). However, we observed that blocking of IL-1R reduced RV-induced CXCL-10 by only 30%, and this does not explain >80% reduction in RV-induced CXCL-10 in IRAK-1 knockdown cells. Airway epithelial cells express IL-33, which binds to the IL-1R–like ST2 receptor and requires IRAK-1 for signaling (37, 38). Although ST2 receptors are primarily expressed on Th2-type immune response cells such as eosinophils, mast cells, and Th2 cells (39–41), airway epithelial cells were also recently shown to express this receptor (30, 42). Because RV stimulated expression of IL-33 as previously reported (30) and also ST2, it is possible that RV may induce IRAK-1–dependent ST2 receptor signaling to stimulate CXCL-10 expression. Consistent with this notion, neutralization of either ST2 receptor or IL-33 abrogated RV-induced CXCL-10. However, IL-33 by itself did not stimulate expression of CXCL-10 in airway epithelial cells, but this was not surprising, because ST2 expression was observed only post-RV infection. These observations indicate that ST2 receptor may become available for IL-33 activation only upon viral infection. Accordingly, exogenous addition of IL-33 further increased RV-induced CXCL-10 production in airway epithelial cells. RV-induced CXCL-10 is regulated by NF-κB, IRF-1, and STAT-1 (14–16) in airway epithelial cells. However, in IRAK-1 knockdown cells, only RV-induced phosphorylation of IκB-α and binding of NF-κB to the endogenous CXCL-10 promoter was significantly reduced compared with similarly infected control cells. There were no differences in RV-induced IRF-1 expression or STAT-1 phosphorylation between IRAK-1 knockdown and control cells. This indicated that IRAK-1–mediated CXCL-10 is at least in part regulated via NF-κB. In this study, we also observed that knockdown of IRAK-1 also reduces the chromatin accessibility at the transcription initiation site of the CXCL-10 promoter. Together, these observations indicate that IRAK-1–mediated NF-κB activation may synergistically enhance RV-induced CXCL-10 transcription by increasing chromatin accessibility. In our earlier studies, we showed that RV induces proinflammatory cytokines, such as CXCL-1, CXCL-2, and TNF-α, in macrophages via TLR2 and depletes IRAK-1 (5). In this study, we found that PMDMs, which closely resemble submucosal macrophages in the lungs (18), express CXCL-10 in response to RV as observed previously (18). Unlike in airway epithelial cells, this response was viral replication independent and requires TLR2/IL-1R, but not ST2 receptor. This is not surprising, because although macrophages express ST2 under unstimulated conditions, they do not express IL-33 (43). However, it is plausible that epithelial cell–derived IL-33 may amplify CXCL-10 expression in submucosal macrophages in vivo. In a mouse model of infection, RV-stimulated CXCL-10 expression was found to be partially dependent on ST2, but the contribution of macrophages to this process in vivo is yet to be determined. Interestingly, blocking ST2 also attenuated RV-induced lung inflammation as indicated by reduction in number of recruited inflammatory cells. Consistent with our findings, influenza virus was also shown to cause exaggerated lung inflammation via IL-33/ST2 signaling axis particularly in cigarette smoke–exposed animals (43). Because our in vitro observations indicate that influenza virus also stimulates CXCL-10 expression via IL-33/ST2, it is conceivable that CXCL-10 may contribute to exaggerated lung inflammation in cigarette smoke–exposed mice. Another novel finding is that CXCL-10 expression in airway epithelial cells regulated by IRAK-1 via IL-33/ST2 signaling axis is not unique to RV but is common for other ssRNA respiratory viruses, such as influenza and RSV. It is plausible that RSV, which activates TLR2 signaling (44), and influenza virus, which activates MyD88-dependent TLR signaling (45), can deplete IRAK-1, and this may limit CXCL-10 production and excessive inflammation caused by these viruses. In summary, our findings indicate that, under normal situations, MyD88-dependent TLR2 activation may limit CXCL-10 expression, thus preventing excessive lung inflammation and tissue damage post respiratory viral infection. Dysregulation of MyD88-dependent TLR signaling could induce excessive CXCL-10 production and probably IFNs leading to severe lung inflammation. Presently, it is not known whether enhanced expression of CXCL-10 during asthma or COPD exacerbations involves dysregulated MyD88-dependent TLR signaling, and this is the topic for our future study. This work was supported by National Institutes of Health Grants HL897720, AT004793, and AT007620 (to U.S.S.).
. 2009. Viral infections in exacerbations of asthma and chronic obstructive pulmonary disease. Minerva Med. 100: 467–478.
. 2012. Updates in the relationship between human rhinovirus and asthma. Allergy Asthma Immunol. Res. 4: 116–121.
. 2008. The role of respiratory viruses in cystic fibrosis. J. Cyst. Fibros. 7: 320–328.
. 2010. Increased cytokine response of rhinovirus-infected airway epithelial cells in chronic obstructive pulmonary disease. Am. J. Respir. Crit. Care Med. 182: 332–340.
. 2012. Rhinovirus attenuates non-typeable Hemophilus influenzae-stimulated IL-8 responses via TLR2-dependent degradation of IRAK-1. PLoS Pathog. 8: e1002969.
. 2009. Role of double-stranded RNA pattern recognition receptors in rhinovirus-induced airway epithelial cell responses. J. Immunol. 183: 6989–6997.
. 2011. Human rhinovirus recognition in non-immune cells is mediated by Toll-like receptors and MDA-5, which trigger a synergetic pro-inflammatory immune response. Virulence 2: 22–29.
. 2010. Co-ordinated role of TLR3, RIG-I and MDA5 in the innate response to rhinovirus in bronchial epithelium. [Published erratum appears in 2012 PLoS Pathog. 8: 1949.] PLoS Pathog. 6: e1001178.
. 2013. CXCL10-CXCR3 enhances the development of neutrophil-mediated fulminant lung injury of viral and nonviral origin. Am. J. Respir. Crit. Care Med. 187: 65–77.
. 2011. Acute exacerbations of chronic obstructive pulmonary disease: identification of biologic clusters and their biomarkers. Am. J. Respir. Crit. Care Med. 184: 662–671.
. 2013. IP-10 is a potential biomarker of cystic fibrosis acute pulmonary exacerbations. PLoS One 8: e72398.
. 2007. IFN-gamma-induced protein 10 is a novel biomarker of rhinovirus-induced asthma exacerbations. J. Allergy Clin. Immunol. 120: 586–593.
. 2005. Human airway epithelial cells produce IP-10 (CXCL10) in vitro and in vivo upon rhinovirus infection. Am. J. Physiol. Lung Cell. Mol. Physiol. 289: L85–L95.
. 2014. Transcriptional and epigenetic modulation of human rhinovirus-induced CXCL10 production by cigarette smoke. Am. J. Respir. Cell Mol. Biol. 50: 571–582.
. 2010. Human rhinovirus-induced epithelial production of CXCL10 is dependent upon IFN regulatory factor-1. Am. J. Respir. Cell Mol. Biol. 43: 413–421.
. 1999. The T cell-specific CXC chemokines IP-10, Mig, and I-TAC are expressed by activated human bronchial epithelial cells. J. Immunol. 162: 3549–3558.
. 2006. Human rhinovirus induces robust IP-10 release by monocytic cells, which is independent of viral replication but linked to type I interferon receptor ligation and STAT1 activation. J. Leukoc. Biol. 80: 1364–1374.
. 2016. Rhinovirus delays cell repolarization in a model of injured/regenerating human airway epithelium. Am. J. Respir. Cell Mol. Biol. DOI: 10.1165/rcmb.2015-0243OC.
. 2005. Well-differentiated human airway epithelial cell cultures. Methods Mol. Med. 107: 183–206.
. 2013. An in vitro model to study heterogeneity of human macrophage differentiation and polarization. J. Vis. Exp. e50332.
. 2008. Human rhinovirus 1B exposure induces phosphatidylinositol 3-kinase-dependent airway inflammation in mice. Am. J. Respir. Crit. Care Med. 177: 1111–1121.
. 2011. Pseudomonas aeruginosa suppresses interferon response to rhinovirus infection in cystic fibrosis but not in normal bronchial epithelial cells. Infect. Immun. 79: 4131–4145.
. 2009. CXCR2 is required for neutrophilic airway inflammation and hyperresponsiveness in a mouse model of human rhinovirus infection. J. Immunol. 183: 6698–6707.
. 2011. Rhinovirus-induced barrier dysfunction in polarized airway epithelial cells is mediated by NADPH oxidase 1. J. Virol. 85: 6795–6808.
. 2010. Quercetin prevents progression of disease in elastase/LPS-exposed mice by negatively regulating MMP expression. Respir. Res. 11: 131.
. 1999. The nuclear factor-kappaB engages CBP/p300 and histone acetyltransferase activity for transcriptional activation of the interleukin-6 gene promoter. J. Biol. Chem. 274: 32091–32098.
. 2011. Role of interleukin-1 and MyD88-dependent signaling in rhinovirus infection. J. Virol. 85: 7912–7921.
. 2014. IL-33-dependent type 2 inflammation during rhinovirus-induced asthma exacerbations in vivo. Am. J. Respir. Crit. Care Med. 190: 1373–1382.
. 2009. Elastase- and LPS-exposed mice display altered responses to rhinovirus infection. Am. J. Physiol. Lung Cell. Mol. Physiol. 297: L931–L944.
. 2008. CXCL10/CXCR3-mediated responses promote immunity to respiratory syncytial virus infection by augmenting dendritic cell and CD8(+) T cell efficacy. Eur. J. Immunol. 38: 2168–2179.
. 2012. Long-term exposure of chemokine CXCL10 causes bronchiolitis-like inflammation. Am. J. Respir. Cell Mol. Biol. 46: 592–598.
. 2015. Increased nuclear suppressor of cytokine signaling 1 in asthmatic bronchial epithelium suppresses rhinovirus induction of innate interferons. J. Allergy Clin. Immunol. 136: 177–188.e11.
. 2013. The role of interleukin-1 and interleukin-18 in pro-inflammatory and anti-viral responses to rhinovirus in primary bronchial epithelial cells. PLoS One 8: e63365.
. 2013. Synergistic expression of the CXCL10 gene in response to IL-1β and IFN-γ involves NF-κB, phosphorylation of STAT1 at Tyr701, and acetylation of histones H3 and H4. J. Immunol. 191: 323–336.
. 2008. TRAF6 is a critical signal transducer in IL-33 signaling pathway. Cell. Signal. 20: 1679–1686.
. 2008. An IL-1 cytokine member, IL-33, induces human basophil activation via its ST2 receptor. J. Immunol. 181: 5981–5989.
. 2012. Interleukin-33 induces interleukin-17F in bronchial epithelial cells. Allergy 67: 744–750.
. 2015. Cigarette smoke silences innate lymphoid cell function and facilitates an exacerbated type I interleukin-33-dependent response to infection. Immunity 42: 566–579.
. 2009. Respiratory syncytial virus activates innate immunity through Toll-like receptor 2. J. Virol. 83: 1492–1500.
. 2010. MyD88 signaling is indispensable for primary influenza A virus infection but dispensable for secondary infection. J. Virol. 84: 12713–12722.